Unusually I had a spare afternoon; a work appointment fell through at the last minute and I had almost all of the afternoon to myself. I was already in Westminster so this was the opportunity to take myself on the Hawksmoor tour I'd promised myself. I had just read Iain Sinclair’s ‘Lud Heat’, his book of poems and short prose pieces published in 1975, in which he created the dark legend of Nicholas Hawksmoor (a legend exploited to the full by Peter Ackroyd in his novel ‘Hawksmoor’ and Alan Moore in his graphic novel ‘From Hell’.) In ‘Lud Heat’ Sinclair sets out a theory that the 8 Hawksmoor churches along with a number of pyramids and obelisks dotted around London form a sacred geometry of power lines in the shape of an ancient Eygptian Hieroglyph "Eight churches give us the enclosure, the shape of fear; ... erected over a fen of undisclosed horrors, white stones laid upon the mud and dust" This ‘enclosure’ covers the ancient city and its Roman temples dedicated to Mithras, its plague pits and cemeteries, its prisons and places of execution and the scenes of its most notorious crimes, the Ratcliffe Highway Murders of 1811 and the Whitechapel murders, the Jack the Ripper killings, of 1888. The Ratcliffe Highway Murders happened almost in the shadow thrown by the massive tower of Hawksmoor’s St George-In-The-East in Shadwell. His Christ Church in Spitalfields was, according to Sinclair a "magnet to the archetypal murder myth of the late 19th century ... The whole karmic programme of Whitechapel in 1888 moves around the fixed point of Christ Church ..." Obviously none of this is coincidence, it is the result of the malign forces summoned by Hawksmoor’s mysterious geometry, concentrating evil and darkness in the East End of London. Although he has a febrile imagination it is hard to believe that a man as sensible as Iain Sinclair really believes all this twaddle. But the myth has gained some currency and Hawksmoor, a protégée of Christopher Wren’s, has acquired all the allure of darkness and mystery as a result. There are 6 Hawksmoor churches (Sinclair gets 8 by including 2 designed in collaboration with another architect but excluding his other great collaboration, the Western Towers of Westminster Abbey) which lie roughly in a straight line from St George’s in Bloomsbury to St Alfege’s in Greenwich. My afternoon off work seemed enough time to do the 6/7 mile walk from Bloomsbury to Greenwich until I remembered that (a) it gets dark at 4.00 now and (b) the Greenwich foot tunnel is closed making a direct walk impossible. I cut my walk down to 5 churches, St George’s, St Mary Woolnoth at Bank, Christ Church at Spitalfields, St George-in-the East at Shadwell, and St Anne’s at Limehouse. Even so I did the last two in the dark. Which meant I had to go back later to get more photographs. There is something odd about Nicholas Hawksmoor’s architecture. It is hard to put your finger on what exactly the oddity is in his six striking London churches. Their sheer scale is impressive; most of them are massive buildings, far bigger than the average London parish church. 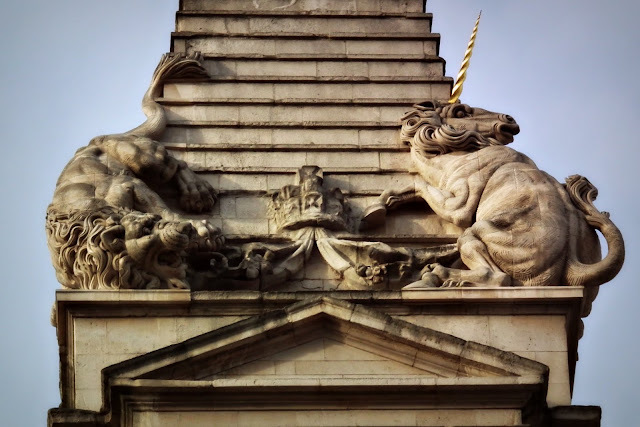 They are built of Portland stone which, when it has been cleaned, as many of them recently have been, is almost blindingly white even in weak London winter sun. 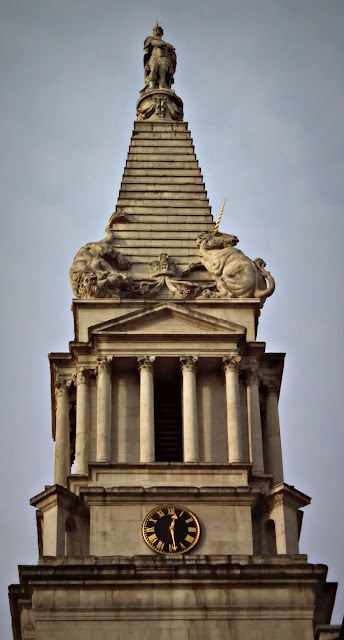 Their style is idiosyncratic; no Hawksmoor church looks like any other church anywhere, even though they are composed, for the main part, out of standard classical elements (though they also almost all contain at least one highly unusual feature). I read somewhere that Hawksmoor built churches that had Gothic silhouettes out of classical elements. Certainly Spitalfields is a bit like that being a spired church but I’m not sure about the others. St George’s in Bloomsbury has a very distinctive stepped tower, almost a ziggurat or a Mayan pyramid. Hawksmoor based it on a written description of the mausoleum at Halicarnassus by Pliny (the portico is based on the Temple of Dionysus at Ballbeck in the Lebanon) and has a statue of George the First in a Roman toga at the top and lions and unicorns, symbolishing the victory over the first Jacobite rising, gambolling around the base. The Lions and Unicorns were recently reinstated, the originals having fallen off in the 1880’s I believe. St George’s, Bloomsbury was the last of Hawksmoor’s churches. Work started on it in 1716 and it was consecrated by the Bishop of London on the 28th January 1730. The church was built at the request of the residents of fashionable Bloomsbury who petitioned the Church Commissioners for a new parish. Bloomsbury belonged to the parish of St Giles-in-the-Fields, the church stands a couple of hundred metres away from St George’s. Those two hundred metres though were occupied by the Rookery, one of London’s most notorious districts, home to every type of lowlife imaginable; whores, bawds, thieves, drunkards, murderers, cut-purses, fences……the area is portrayed in Hogarth’s “Gin Lane”. The tower of St Georges is clearly identifiable in the background, just below the pawnbrokers golden balls. The church has been recently restored back to its original glory thanks to British vice (gambling money from the Heritage Lottery fund) and American philanthropy from Anglophile multi-billionaire Andrew Mellon’s estate. Although quite a lot is known about Nicolas Hawksmoor’s professional life, very little is known of his private life or his personality and for that reason he remains a relatively enigmatic figure. He was born in 1661 or 1662 at East Drayton in Nottinghamshire. He probably went to grammar school and he worked first as a Judge’s clerk before moving to London at the age of 18 to work as a domestic clerk for Sir Christopher Wren, Surveyor of Works to King Charles II. 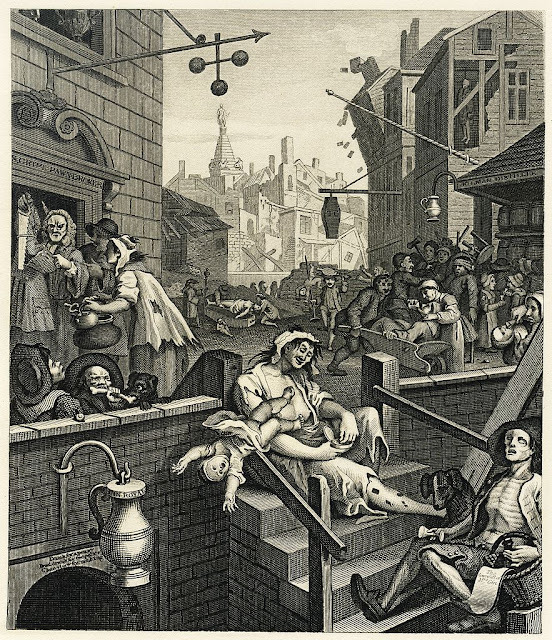 Hawksmoor remained closely associated with Wren for the rest of his employers life. His duties within his mentors household changed and he became almost exclusively involved in working on Wren’s architectural projects. He was senior draftsman on the reconstruction of St Paul’s for more than 19 years and he worked on the construction of the Royal Naval Hospital in Greenwich. In 1699 he met Vanbrugh and worked with him on the Earl of Carlisle’s home at Castle Howard and the Duke of Marlborough’s Bleinham Palace. He did independent work in Oxford and Cambridge, including the remodelling of All Soul’s College in Oxford and designed the two West Towers of Westminster Abbey (which most people assume are the same age of the rest of the medieval building but are in fact only 300 years old). But his most celebrated achievements are the six London churches he built following the 1711 Act of Parliament requiring 50 new churches to be built in the capital and its suburbs. The act set up a commission, headed by Sir Christopher Wren to direct the work. Wren appointed Hawksmoor to work on designing and building the new churches. Only 12 of the 50 were built by the time the commission was wound up in 1733; 6 of them exclusive Hawksmoor creations, and two others designed in collaboration with John James (who was another of the commissioners). Hawksmoor’s work wasn’t always appreciated. Horace Walpole called St George’s “a masterpiece of absurdity” (though, to be fair, he also said that Hawksmoor’s Mausoleum at Castle Howard was so beautiful it would tempt one to be buried alive), the London Guide of 1876 described it was the “the most pretentious and ugliest edifice in the metropolis”, a sentiment echoed by Pevsner who also described it as ugly. After arousing a fair amount of controversy in his own lifetime, in the 19th century and for much of the 20th century Hawksmoor aroused only indifference. By the 1950’s Christ Church at Spitalfields was scheduled for demolition. 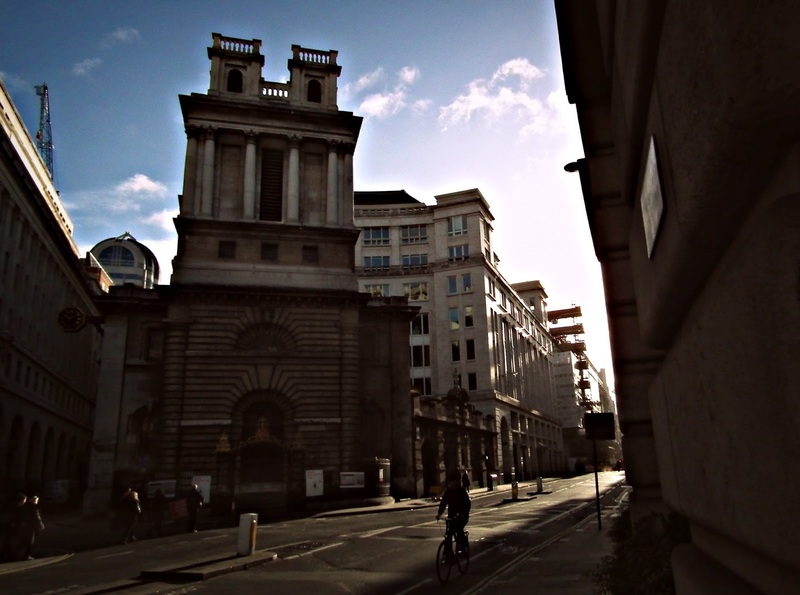 The photo above is looking down King William Street with St Mary Woolnoth on the corner. 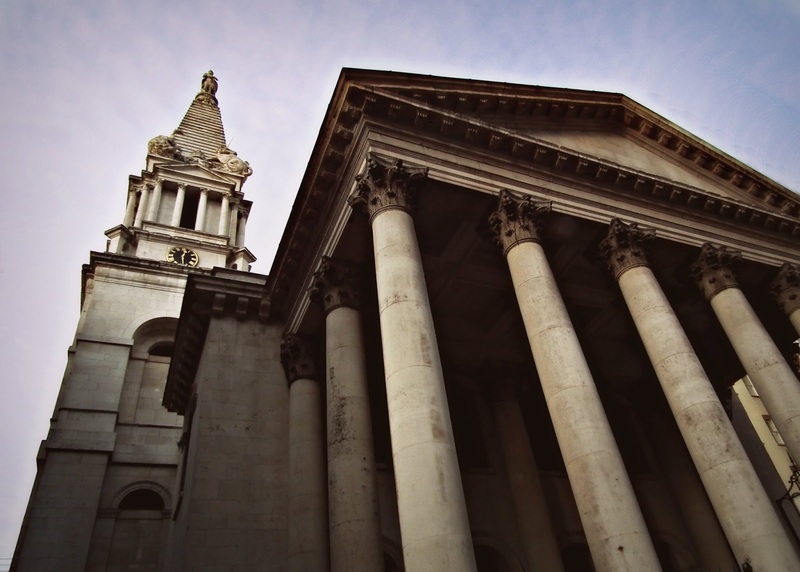 It is, along with Christ Church at Spitalfields, generally acknowledged as Hawksmoor’s masterpiece. In Peter Ackroyd’s novel the architect bludgeons a colleague to death as a human sacrifice and drops the body into the foundations of St Mary’s. There are no bodies around St Mary’s now. 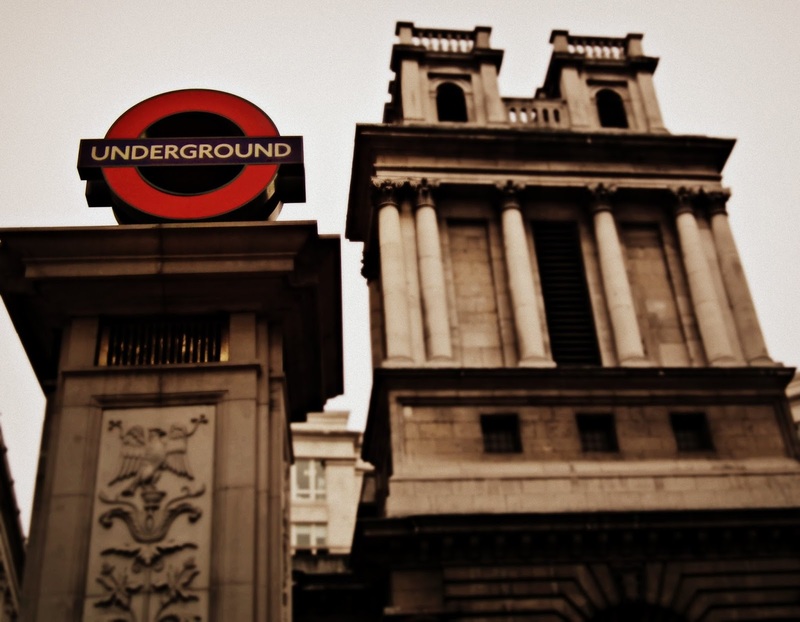 Between 1897 and 1900 the City and South London railway built Bank tube station beneath the church. They had originally been given permission to demolish the church but a public outcry caused a rethink. The company has to restrict itself to using only the subsoil on the site. They were forced to purchase the crypt and to remove the bones for reburial at the City of London Cemetery in Manor Park. The church structure was supported on steel beams and girders to allow the excavation of lift and staircase shafts for the station directly beneath the floor of the building. From Bank it is a short walk up Cornhill, to Gracechurch Street and on to Bishopsgate. One of the principal streets in the City of London Bishopsgate is named after one of the seven gates in the original London wall. The gate had existed, in one form or another, since London was a Roman city but it was demolished in 1760. By this time the walls were redundant and the gates an obstruction to the movement of traffic in what was then the world’s biggest city. 46,000 people work in Bishopsgate ward but there are only 48 residents. It is an area of offices, shops and stations – Liverpool Street is about halfway up it. It was the site of an IRA truck bomb in April 1993 which killed a journalist, injured 40 and caused over £1 billion of damage. It caused so much havoc in fact that Lloyds of London looked like the insurance payouts might sink them, triggering a crisis in the insurance business. As I walked up the street an empty Marlboro packet perched on the red plastic bench of a bus stop caught my eye. Like a dosser I couldn’t help giving it a quick shake to make sure there wasn’t a forgotten cigarette inside it. It is over three months since I stopped but I still get the odd urge now and then – well, more than now and then to be honest. Two or three times a day. Even more irritatingly I dream about cigarettes quite regularly. I dream about buying them, about finding forgotten packets in drawers or rucksacks, about being given them. I sometimes dream that I’ve smoked one and find myself in a mild panic about being found out. All these dreams make me feel guilty for having given in to temptation. I never dream about actually lighting one up though and smoking it, mores the pity. At least that might be a substitute of a sort. 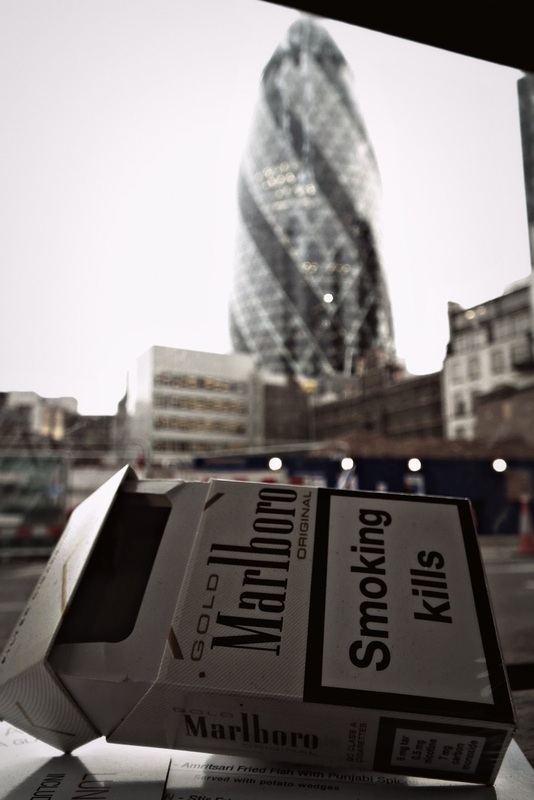 The picture below is also taken on Bishopsgate. 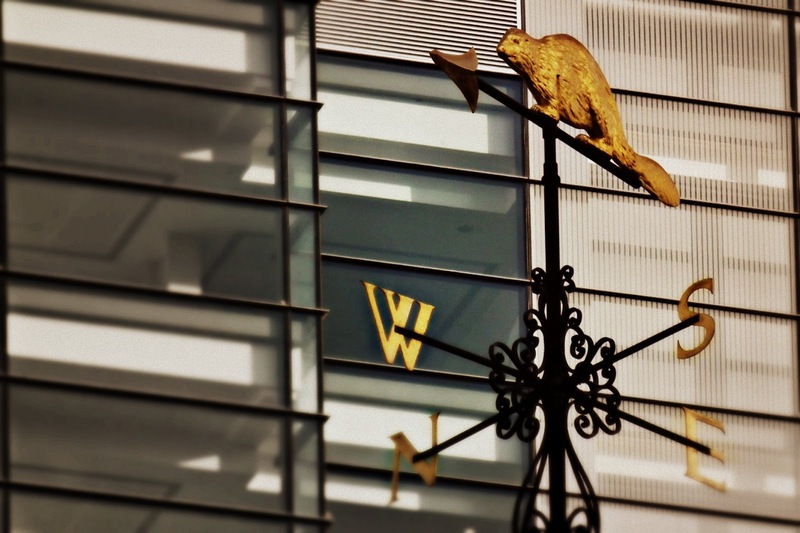 The Golden Beaver is at 60-64 Bishopsgate above what was Hudson House, the home of the Hudson Bay Company. The office block in the background is Heron Tower at 230 metres the tallest building in the city of London and the third tallest building in London (after the Shard and Canary Wharf).